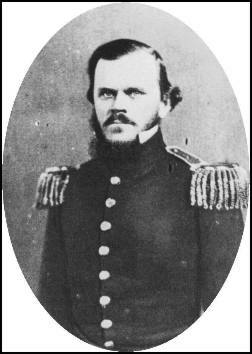 Nathan George Evans: born Marion, SC 2/3/1824; nicknamed “Shanks” for his thin legs; brother of Chesley D. Evans, signer of SC ordinance of secession; brother-in-law of CSA general Martin W. Gary; attended Randolph-Macon College in Virginia; West Point Class of 1848 (36 of 38); Bvt 2nd Lt. 1st Dragoons 7/1/48; served on frontier duty in Texas1848-55; 2nd Lt 2nd Dragoons 9/30/49; 1st Lt 2nd Cav 3/3/55; duty in Kansas, 1855-1860; Sioux Expedition, 1855; Capt. 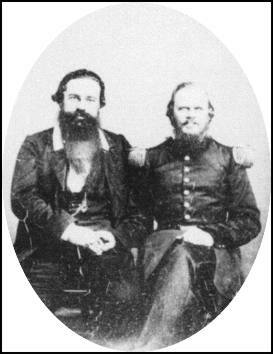 (5/1/56 per Heitman, 12/20/55 per Cullum); Cheyenne Expedition 1856; Utah Expedition, 1858; Arkansas River Scout, 1859; Kiowa and Comanche Expedition, 1860; duty in Colorado, 1860; leave of absence, 1860-61; married Ann Victoria Gary, 3/20/60; resigned 2/27/61; Maj. SC Militia, AAG, 1/61; Capt ACSA Cav 3/16/61; Maj. CSA 3/16/61; AAG James Island Forces, 6/61 to 7/20/61; Col. CSA 4th SC Inf, 7/61; 7th Brigade, Army of the Potomac (AotP), 7/20/61 to 10/12/61; BGCSA 10/21/61 (n 10/21/61, c 12/19/61); 4th Brig., 4th Div, AotP, 10-22-61 to 10-24-61; Brg. X, Div. X AotP, 10/24/61 to 11/12/61; 1st Brig. 2nd Div. 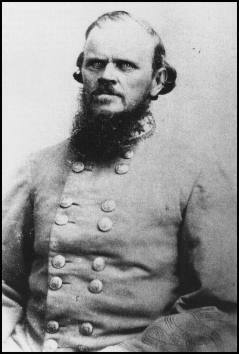 AotP, 11/12/61 to 12/18/61; 12/18/61 received Thanks of Confederate Congress “for the brilliant victory achieved by them over largely superior forces of the enemy in the battle of Leesburg [Ball’s Bluff]; 3rd Subdistrict, District of SC, Dept of SC, GA & East FL, 12-18-61 to 3/14/62; 3rd Subdist, Dist of SC, , Dept of SC & GA, 3/14/62 to 5/28/62; 2nd Subdist, Dist of SC, Dept of SC & GA, 5/28/62 to 6/19/62; Brig X, 1st Subdist, Dist of SC, Dept of SC & GA, 6/19/62 to 7/8/62; 3rd Brig, Jones’s Div, First Corps, Army of Northern VA (AoNV), 7/8/62 to 8/9/62; Evans’s Brig, Hood’s Div, First Corps, AoNV 8/9/62 to 11/6/62; Evans’s Brig, Dist of NC, Dept of NC, 11/6/62 to 3/3/63; James Island, 1st Subdist, Dist of SC, Dept of SC, GA & FL, 5/15/63 to 5/25/63; Evans’s Brig, Loring’s Div, Army of MS (AoM), 5/25/63 to 6/63; Evans’s Brig, Breckinridge’s Div, Army of TN (AoT), 6/63 to 6/21/63; Evans’s Brig, French’s Div, AoT, 6/21/63 to 8/3/63; Brig X, 2nd Subdist, Dist 1, Dept of SC, GA & FL, 8/3/63 to 9/15/63; arrested by Gen. P. G. T. Beauregard for disobedience of orders, Sept. 1863; acquitted of charges 11/5/63; Evans’s Brig, 1st Subdist, Dist of SC, Dept of SC, GA & FL, 3/11/64 to 3/21/64; 1st Subdist, Dist of SC, Dept of SC, GA & FL, 3/21/64 to 10/17/64; wounded after falling from his horse, 4/16/64; 2nd Subdist, Dist of SC, GA & FL, 10/17/64 to 11/5/64; failed to secure a command through to the end of the war; no record of parole; high school principal, Midway, AL, until his death on 11/23/68; buried Tabernacle Cemetery, Cokesbury, SC. Sources: Cullum, Biographical Register of the Officers and Graduates of the U. S. Military Academy, Vol II, pp 365-366; Eicher & Eicher, Civil War High Commands, pp 228-229,793; Heitman, Historical Register and Dictionary of the U. S. Army, Vol. I, p. 410; Silverman, Thomas & Evans, Shanks: The Life and Wars of General Nathan G. Evans, CSA; Wert in The Confederate General, Vol II, pp 107-108; Warner, Generals in Gray, pp 83-84. Thanks, Teej. I’m always leery of wartime charges of drunkenness, because they get bandied about so cavalierly. The only bio of Evans that I have is written partly by a descendant, and you know how those books go. The chapter titled “Kinston” is pretty much a defense of Evans. Goree does sound a bit like the Church Lady, doesn’t he? That letter from Goree referring to events following Ball’s Bluff couldn’t have been written on “10/18/61.” That must be a typo. The battle was on 10/21. Perhaps the date of the letter should be 11/18/61? Also, “a few days after Ball’s Bluff,” there were no yankees there for Evans to have attacked anyway. They were gone from the Edwards Ferry beachhead and back in Maryland by 4:00 a.m. on the 24th. Had Evans attacked them before that, he’d have been attacking a dug-in force larger than his own. The 13th Mississippi tried that on the afternoon of the 22nd and got handily repulsed. Even if Goree was right about Evans being drunk, the criticisms of Evans for not attacking are off base. Thanks, I’ll take a look at Goree when I get back home and look at it again. I may have got the date wrong and heck, maybe I did a bad job of summarizing the thing. The point of my citing it was that it illustrates Evans’ reputation, but still I should get the facts right. I checked the Goree book and the date is as it appears in the book, 10/18/61. Now, it’s a very long letter, and it’s possible that it was written over a period of time and merely started on the 18th. Without seeing the document itself, I can’t know for sure. And we have to consider the possibility that the editor got the date wrong, or it is simply a typo. But there is surely an inconsistency here. You might want to add my book “Wandering to Glory: Confederate Veterans Remember Evans’ Brigade” (USC Press, 2002) to your bibliography. It it the only history so far of the brigade and the only history of Evans himself not written by a descendent. I don’t have your book – that’s why I didn’t use it as a reference. I’ll have to pick that one up. Thanks for stopping by and commenting. I hope you enjoy the site. If you have any more info on Evans (or anything else you think might help), please feel free to share!